What a great family keepsake! 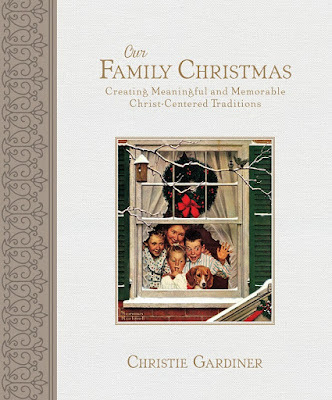 I am so excited to use this beautiful hardcover book as a resource to help my family invite the spirit in our home this Christmas through meaningful activities together. Each chapter contains of six parts: a quote/scripture, a story/poem/insight, ideas for counting down, a recipe, a hymn/song, a question for a journal prompt. I was impressed by the variety and creativity of the ideas and how they can work for families of all sizes and ages. I absolutely love all the Christmas-themed vintage art and illustration throughout the book and the spirit of nostalgia and sentimentality they provoke. They are full-page with high quality printing. The songs include the sheet music so they can be played on an instrument if desired. They are well-known and well-loved classic songs that are easily recognized and can be sung without accompaniment or can be found on the internet to sing along to :) The recipes are also holiday classics and range from treats to soups to play-dough to gingerbread houses. They are simple enough that we are likely to have all ingredients and my daughters can help prepare them. I'm especially looking forward to trying the Hearty Basil Potato Cheese Soup! This would make a lovely and thoughtful gift for the holidays, and well worth the price. It could be used several times over the years. Highly recommend!